Near new 2017 family van with triple bunks (suitable for kids no more than 6ft and under 90kgs), queen island bed and a dinette that converts into another bed. Combined shower and toilet ensuite, plenty of cupboard space and TV with DVD player, which can be used outside too. Van comes equipped with 5 camping chairs and outdoor tables along with Webber Baby Q BBQ and utensils. There is a large family friendly fridge and freezer along and a portable Engel fridge can be supplied for extra drinks outside (beer fridge). It also has reverse cycle air conditioning, griller, cooktop and oven. Basically it comes with everything you need to have a great time away with your family. Minimum of 5 day hire over the Christmas/January period. If you wish to tow the van your vehicle must have electric brake controller fitted, legally able to tow 3 tonnes and have experience towing. I can also deliver and set up the van within the Port Stephens area if you'd rather this option. If you can't tow, I will tow the van to any park within the Port Stephen area and set it up for you for free (you just pay the site fees). NO Smoking and NO pets (not negotiable). The Manor Van was fantastic to use! 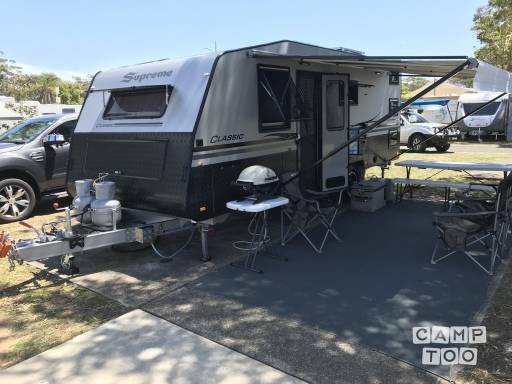 It was very clean and came very well setup which made the trip away easy as you didn’t have to bring anything other then your food and clothes. Stewart the owner was fantastic to deal with and was so helpful from the beginning of the booking process right through to pickup/checkout. We would absolutely recommend using this van as it’s perfect for families or a couple who would like the extra space. Je kan de caravan ophalen in Corlette bij Stewart.